The Common Hackberry - celtis occidentalis, is a deciduous tree or sometimes large shrub. It grows primarily in an erect upright fashion with a single trunk and low branching, rounded, broad crown. The branching habit of the Hackberry can range from slender and horizontal to zig-zag or irregular. It is native to stream banks, flood plains, wooded hillsides and often found in areas that are moist from 0-1800 m. In the North they can be found from Quebec, Ontario, Manitoba and Maine, in the South from North Carolina, Georgia and Alabama, West through Wyoming, Colorado, Arkansas, Northern Oklahoma and Northern Texas. Most easily recognized by the combination of alternate, simply shaped leaves that are 3-14 cm long and coarsely toothed and the hard rounded single stoned drupe. The bark is light brown ans silvery gray, divided into narrow ridges with corky wart like growths. The leaves are alternate, simple, thin, leathery and either broadly ovate, ovate-lanceolate or triangular in shape. The leaf tips are usually abruptly pointed and the edges are coarsely toothed from mid-blade to the tip. The upper leaf surface is light green or blue-green and the lower is a paler green. The flower is greenish in color and tiny, 5 sepals and absent of petals, found in the Spring growing solitary on the axils of the upper leaves. The fruit is an ellipsoid or rounded single stoned orange-red or purple drupe, with a cream colored stone, maturing in the Fall and shriveling but persisting through winter. 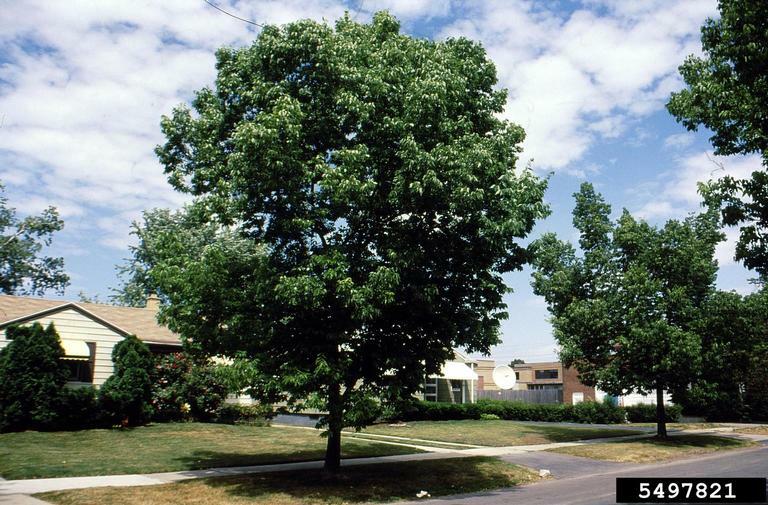 The Hackberry is recommended for hardiness zones 3-9 and is considered both a shade tree and an ornamental. On average the Hackberry reaches heights of 40-60 feet tall and the same broad, maximum recorded heights are upwards of 115 feet tall. It is a fast grower and can gain 12-24 inches in height per year. Hackberry fruit is a popular food for Winter Birds including the Cedar Waxwing, Mockingbird and Robin. The tree also is very attractive to many butterfly species including, Comma, Hackberry, Mourning Cloak, Tawny Emperor, Question Mark, and American Snout. Benefits of natural wood chips for your gardens!